Acting Balanced: Are you Thirsty for More Comments on Blog Post? Link up here! 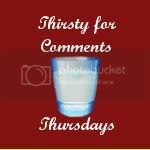 Are you Thirsty for More Comments on Blog Post? Link up here!